Home » Divergent » personal » Procession » Thanksgiving » Veronica Roth » Thanksgiving: What am I thankful for? Thanksgiving: What am I thankful for? I used to join the procession when I was young. I didn't care back then if the melted candle scalds my hands. I didn't mind if my feet become sore because of walking for too long. It was a fun activity. 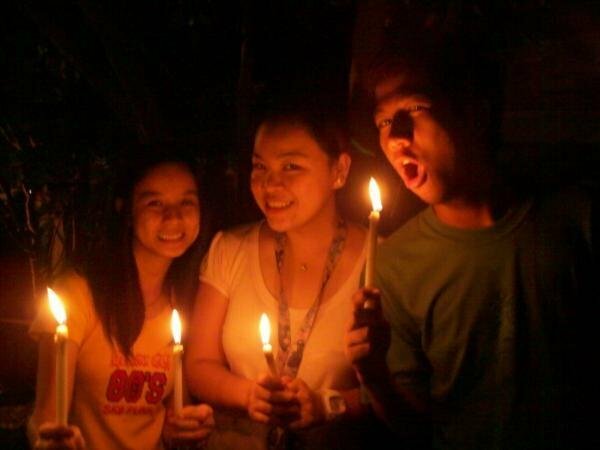 The last time I joined the procession was three years ago, with my friends. Look at our picture! November last year, I was so sad. You PROBABLY know why. Clue, clue! Health issues. hoho! I was teary-eyed whenever the procession passed by our house. I had always, ALWAYS prayed to God (and Mama Mary) to make me feel well. And they did. So I am thankful. No, REALLY THANKFUL and BLESSED. Yesterday was the last day of the procession for this year. Surprisingly, when it passed by our house, I felt peaceful. I didn't ask for anything. I just thank God for all the blessings He had given me and my family. I feel contented and yeah, that's all I need. That's all WE need. "The last time I joined the procession was three years ago..."
(c) 2012, bec. of work maybe? hahaha. Usually pagdating ko ng hawz, nakadaan na ang prusisyon. may ganito rin sa amin at noong bata pa ako lagi rin akong nakikisali sa prosisyon!